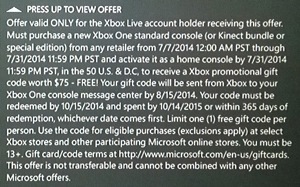 Xbox offering money back if you buy an Xbox One? I’m amped for the Xbox One to launch in SA. I’ve even made a (massive) space for it in my TV cabinet, so I’m prepared. Some people are getting credit on Xbox Live if they buy an Xbox One – is this an incentive or an apology? 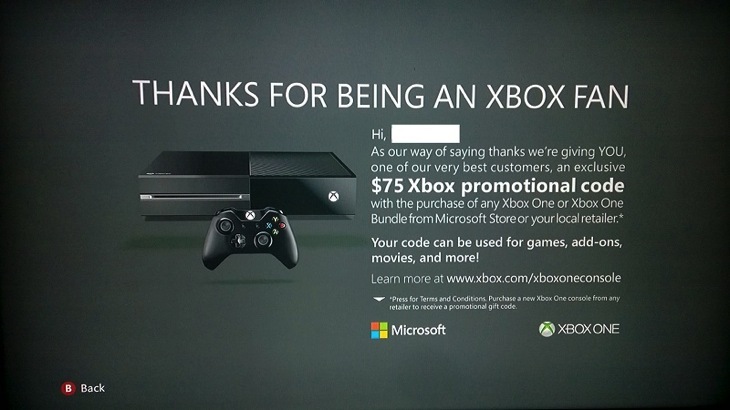 When some people turned on their Xbox 360, they received the following message giving them an extra $75 to use on games, add-ons (read: DLC) or movies if they bought an Xbox One. However, some are more equal than others with this offer. Not everyone is getting this special offer, nor will they. These terms and conditions imply that it’s only available for a short time, and only to gamers in America. Plus, you’ll need to turn on your Xbox 360 to check if you get this offer, and mine hasn’t been plugged in for a while – basically since I got my PS4. I’m glad that Xbox is offering money to some people – the more cash people have to buy games or movies or DLC, the better. With that kind of money, gamers could buy Valiant Hearts or other excellent downloadable titles. NeoGAF, where these pictures originated, discussed why this offer was extended to some and not others, and there was raging debate about if it means yet another price cut is coming. I doubt that we will see more price slashing anytime soon – Microsoft needs to see if their Kinect-free version will sell now that it’s more competitively priced, and they still need to release in South Africa and all those other countries it neglected at launch. While it’s a nice offer right now, I think people will expect similar rebates coming closer to key sales times at the end of the year. With games getting increasingly expensive, a rebate like this would mean that gamers could actually get a couple games for the next console, instead of only playing FIFA until their eyes roll back into their heads, never to be seen again.